DALLAS -- President George W. Bush and first lady Laura Bush said Thursday that they have bought a house in a wealthy enclave in Dallas and will return here once the president leaves office. The White House wouldn't confirm the address, but local real-estate mavens have pinpointed the site of the Bushes' new digs: a multimillion-dollar 8,500-square-foot house in a neighborhood called Preston Hollow. The one-story brick house at the end of a cul-de-sac named Daria Place has a relatively unimposing exterior, but backs up to a much-grander multiacre estate owned by billionaire investor Tom Hicks. 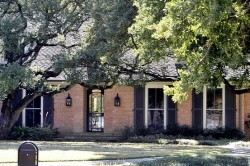 Appraised for tax purposes at $2,078,660, the house believed to be the Bushes' new Texas home was built in 1959, but has been extensively renovated. It sits on slightly more than one acre. The house has four bedrooms, 4½ baths and a wet bar. Also on the property: a servants' quarters, a cabana, a detached garage and a storage building. By contrast, the six-level, 55,000-square-foot White House, with 35 bathrooms, sits on 18 acres. A deed of trust indicates the buyer took out a $3,074,239 mortgage on the property from Community National Bank in Midland, Texas. The mortgage also has an unusual clause, requiring full repayment in just four years, by Oct. 1, 2012. According to public records, the house was purchased Oct. 1 in trust by Robert McCleskey, the president's personal accountant and a friend going back to their boyhood days in Midland. Mr. McCleskey has previously handled other work as a trustee overseeing the Bush family's assets. He declined to comment. "I've known for a couple of months," said Douglas Newby, a real-estate broker who said he has handled many properties in the area, including the Hicks estate, and had the Bush house appraised earlier this year for about $2.5 million. "Even if I didn't, when you have somebody from Midland buying a house here out of the blue, it's pretty obvious." Though real-estate sales have slowed in Dallas in recent months, the housing market is one of the strongest in the country; housing prices here have fallen less than 3% in the past year, according to the S&P/Case-Shiller index. Mr. Bush had previously made clear that he intended to settle in Dallas, where the family lived from 1988 through 1995 before moving to the Texas Governor's Mansion in Austin. His presidential papers and a related think tank are going to Southern Methodist University in Dallas, where Mrs. Bush went to college. In a statement Thursday confirming the purchase of a home in Preston Hollow, the White House didn't disclose the exact location. "The President and Mrs. Bush do not have occupancy of the home, and therefore, no additional details will be provided," the first lady's press secretary, Sally McDonough, said in a statement. The Bushes are also keeping their ranch in Crawford, Texas.